. يقدم Surf Parade Resort خدمات لا غبار عليها وكل أشكال اللياقة وحسن الضيافة اللازمة لإسعاد ضيوفه. يقدم الفندق واي فاي مجاني في جميع الغرف, تسجيل وصول/خروج سريع, تخزين الأمتعة, واي فاي في المناطق العامة, صف السيارات لضمان الراحة القصوى لضيوفه. تنعكس أجواء Surf Parade Resort في غرف الضيوف.تلفزيون بشاشة مسطحة, حوض الاسترخاء, غرف لغير المدخنين, مكيف هواء, تدفئة هي بعض الميزات الموجود في العديد من الغرف. يقدم الفندق مجموعة واسعة من وسائل الراحة المتنوعة، كمثل: مركز للياقة البدنية, ساونا, مسار جولف - ضمن 3 كم, حمام سباحة خارجي, حمام سباحة داخلي. إن Surf Parade Resort هو مكان مثالي للمسافرين الذين يتطلعون إلى الراحة والاستجمام في جولد كوست. Can not fault Surf Parade resort. 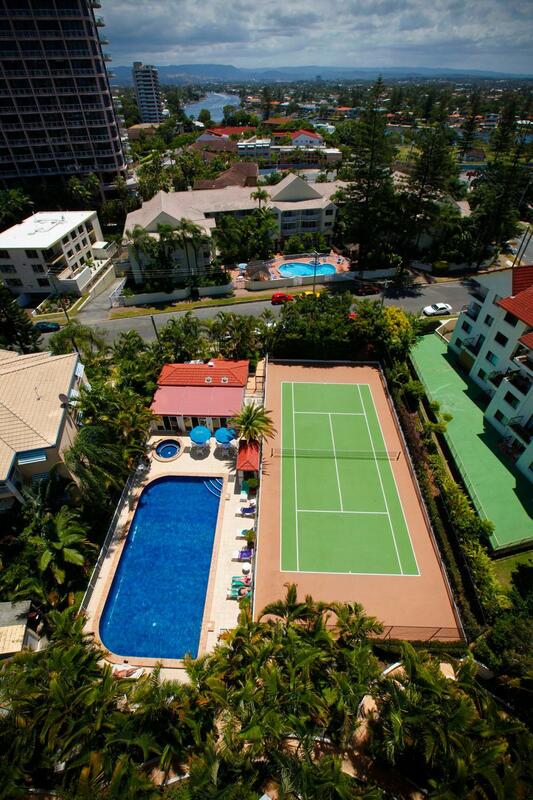 Best value for money on the Gold Coast. Heated pool and spa was great. Lovely surroundings. Bathroom has a spa, apartment was clean and nicely appointed furnishings. Perfectly situated , 5 min walk to the beach and 2 mins drive to Broadbeach shops, 5 mins to Pacific fair and the heart of Surfers Paradise. 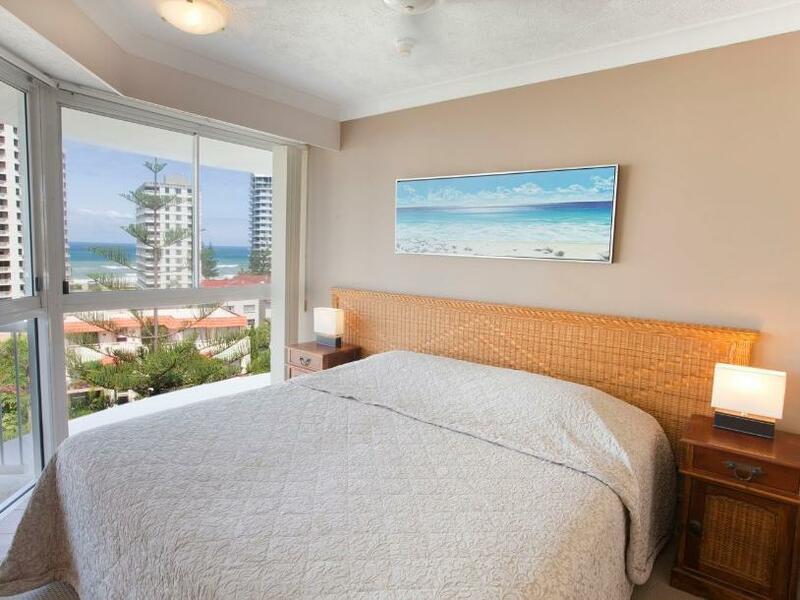 I have stayed at numerous places on the Gold Coast and Surf Parade I’ve stayed twice in and is my favourite place of any I’ve stayed in. So close to the gorgeous beach. Wonderful pool. We had an amazing view of both the beach (between the buildings in the street in front) and the city. We had Rosellas come visit us on the balcony. Nice light filled room with kitchen and washer dryer etc. Apart from the big wall clock with no batteries in it, everything else was perfect. 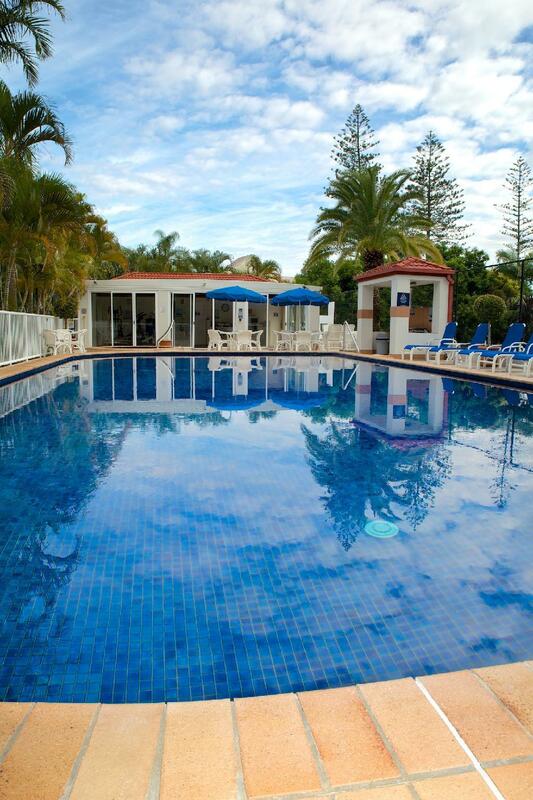 Extensive facilities, clean, tidy, modern, great views from the balcony and a very comfy bed. Nice staff too. I guess the time of day is of little consequence on the sunny Gold Coast! 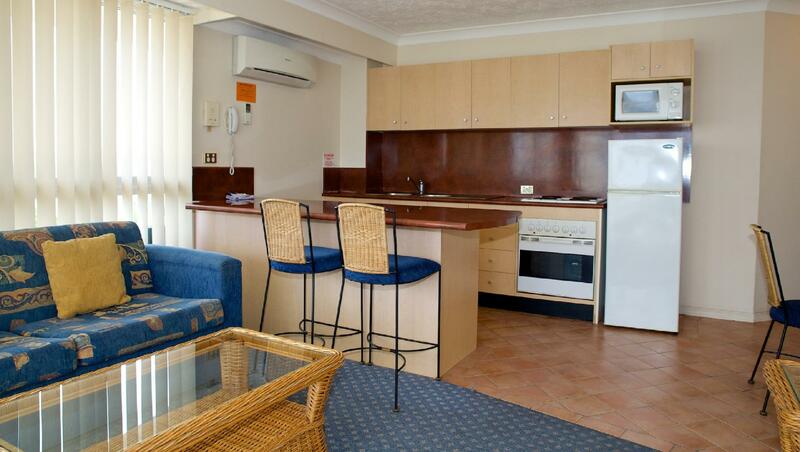 The place was very clean and all people, from staff to other stayers were very friendly. The place was very quiet as well, and private. It is worth staying as all facilities made the place feel safe and homely. Nice sized rooms and tastefully done. Facilites were good. A bit out of town was the only thing to let this site down when the Jewel Hotel opens perhps this will fix this with cafes underneath if that's the plan. The outdated vertical Blinds fell off the brackets to let the sunlight in the morning to keep us from sleeping in. hv a great stay with great staff. room was very spacious, minor thing is they dont provide tissue box and only do cleaning if we stay more than 8 nights. anyway reasonable price and convenient location though. Stayed in the apartment for a week for the Gold Coast Marathon. Friendly staff and room was equipped with basic facilities such as TV, fridge, washing machine, microwave oven, stove etc. Bus stop outside apartment have direct buses to theme parks. Great stay overall. I stayed there for a week of work in the Gold Coast and it was lovely. Staff was very helpful and nice, and the resort facilities were perfect: I could relax at the sauna and spa after a day of work. The apartment was clean an cozy and it had everything I need. Location was very convenient, close to both Surfers Paradise and the classier restaurants at Broad Beach. I would certainly recommend Surf Parade Resort. Location was great. Near the beach and central. Kitchen was well equipped. The apartment was spacious. I was very pleased with my stay in Surf Parade Resort. The staff at the reception was very friendly and helpful. The rooms very well cleaned before use. And the facilities were sufficient. I would recommend travellers to book this resort. I stayed for a week. Check-In was a breeze. Room was clean, washroom was nice with the jet tub and kitchen is fully equipped. I will definitely recommend this aparment. We stayed here for one night, and were disappointed with the standard of the room. The cleanliness of the room was poor, and the room suffered from a lack of maintenance. There were tiles missing from the bathroom floor, and the blinds were missing slats. The main problem was that the television wasn't working. The manager attended the room to attend to the problem. He was rude, arrogant and significantly affected by alcohol. Needless to say, the problem was not resolved. We encountered the same individual at check out, and he continued his abuse, apparently upset about having been interrupted the previous evening. Don't even consider staying there! i booked it hoping for an ocean view room on a higher floor but sadly we got a room on 3rd floor with no view of the ocean as the resort is behind many other hotels thus there will be very little view except on higher floor probably. can't be sure of that either. i found many other hotels of same range near surfers paradise esplanade and those are better locations which i found out later when we went there. Underground parking was free and the apartment was old and there was no cleaning done for our 5day stay. The best part was the whirlpool bath tub and kitchen amenities were good. Gym had nothing. swimming pool was big and sauna seemed ok. i would prefer this next time only if i find it in lower cost compared to the ones near esplanade. Totally i had a very pleasant stay with beautiful view of the ocean. The front desk lady name Cathy was very kind and helpful by providing us the details to move around in gold coast. Bus and trams are just walking distance. TX 3 goes to movie world and wet & wild, 710 goes to sea world. From the resort use Florida Garden tram station to travel from Broad beach south to University hospital station for shopping. If u like Thai food go to Choparaya Thai restaurant situated near to North cliff station. Please do not go to Chang Mai Thai restaurant whereby they are very popular but service and food is very poor. For Thai massage you can visit 5 star Thai massage located near the same station. The massages are Japaneses but they do professional Thai massage. The gold coast beach is just a walking distance thru First ave. I and my family had a wonderful time in the beach where the wave can rise up to 4 to 5 meters. Over roll i will go back to the same resort if i visit gold coast again. 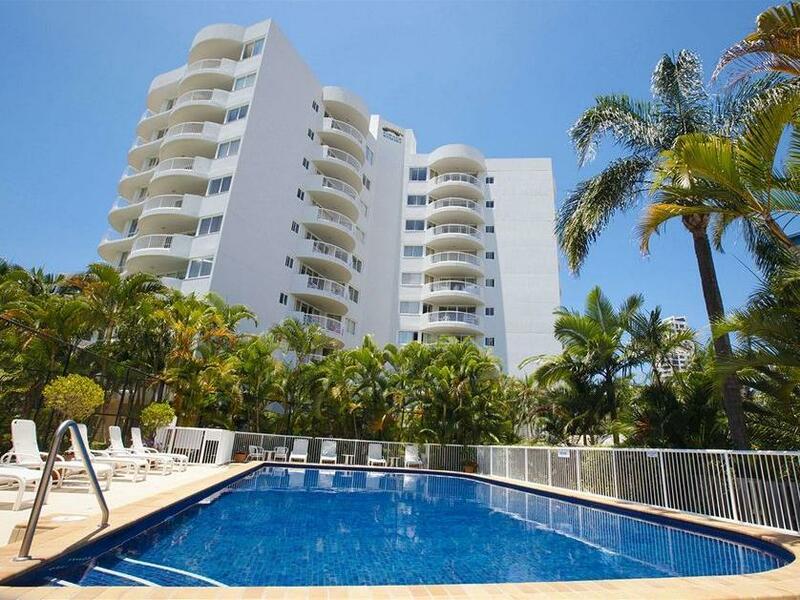 Location acceptable, 2 G-link stations away from surfer paradise. Room size and tidiness good. No daily room cleaning and refill, unacceptable. Paid more for a seaview room but seaview occupied only 20% of the flat view. Staff said 20% is the sea view. UNACCEPTABLE and DISAPPOINTED, just like being cheated. Wifi usage limited to 500MB, even stay for 4 nights, unacceptable, can be more generous.